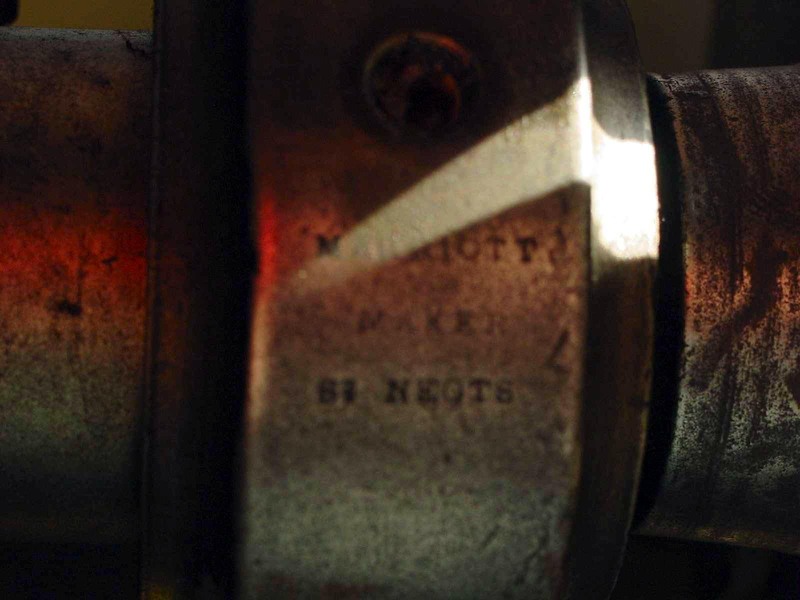 Long forgotten - though not without with a number of unusual design features - the Marriott lathe was built in St. Neots, England by one Ambrose Marriott at some point between 1863 and 1870. Born in Higham Ferrers, Northamptonshire in the last quarter of 1837, Ambrose Marriott was the son of a blacksmith and followed his father into the trade, being listed in the 1861 census as such. 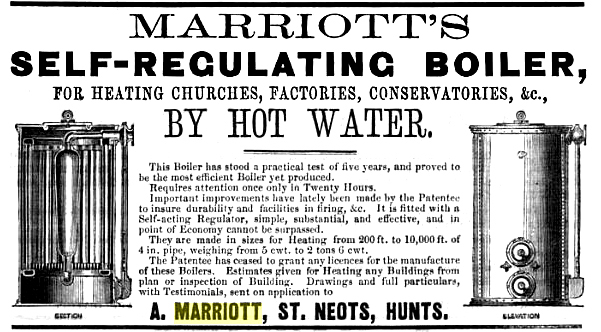 However, in 1863 he took out a boiler patent and had a workshop and business in St Neots, Huntingdon, described as: Marriott, Ambrose, hot water & gas engineer & contractor, patentee & sole manufacturer of the self-regulating boiler for heating buildings etc., & at St Neots." Unfortunately, late in 1869, he was declared bankrupt and returned to Higham Ferrers where he specialised in hot water engineering (his patent heating system being ultimately successful and was installed in various churches, factories and other large buildings. In the summer of 1870 (while still in the middle of bankruptcy proceedings) he took out another patent relating to his self-regulating boiler, calling himself Ambrose Marriott, Agricultural Engineer, Higham Ferrers. Accordingly, he must have abandoned St Neots in that year, probably leaving his lathe behind to be sold along with everything else (the administrators declared a final dividend of just three shillings, eight pence and three-farthings in the pound - a comprehensive bankruptcy). 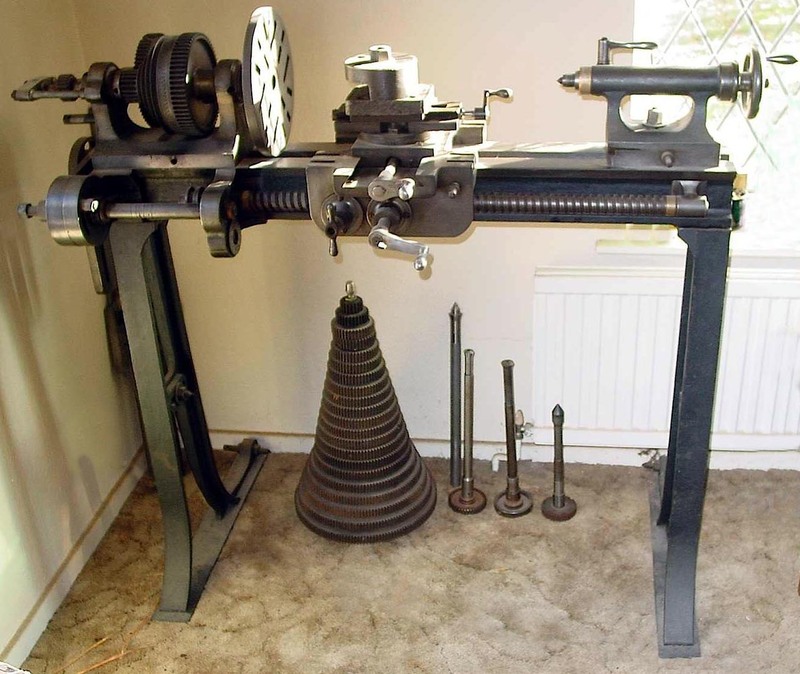 There is no surviving evidence that he manufactured any other machine tools - and so the lathe shown below may have been the only one produced and used only by him. He died in the Higham Ferrers area in the second quarter of 1925, aged 87. With a 47/8" centre height and admitting 18" between centres, the Marriott lathe featured a very coarse pitch leadscrew of 2 t.p.i. and was held together not by Whitworth nuts and bolts, but ones of the maker's own devising and of a rather fine pitch. 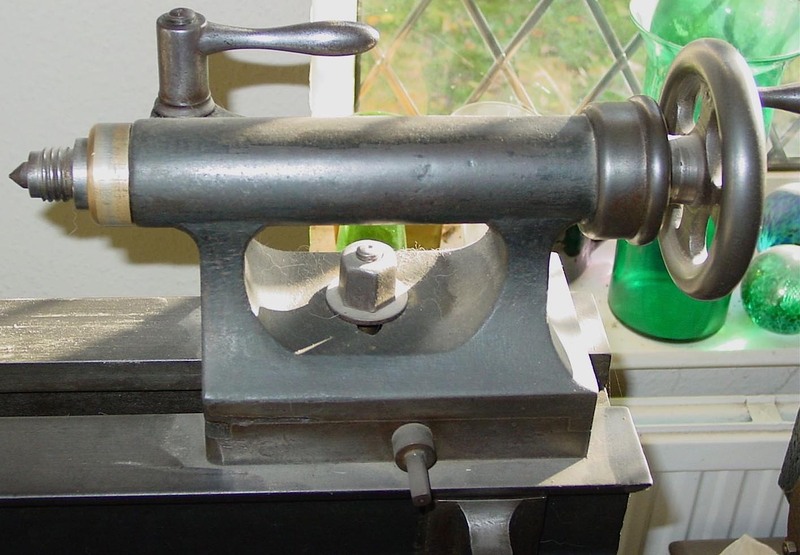 Although not an ornamental lathe, the Marriott appears to have been no ordinary commercial product intended for a life of slavery in a repair workshop, but an elegantly conceived machine that shows evidence of ingenious design, careful craftsmanship in its construction and with much effort expended to obtain a fine cosmetic finish. Supported on ordinary "standards", the bed was of the usual English pattern with a flat top and angled sides with, in this case, no gap to weaken it. 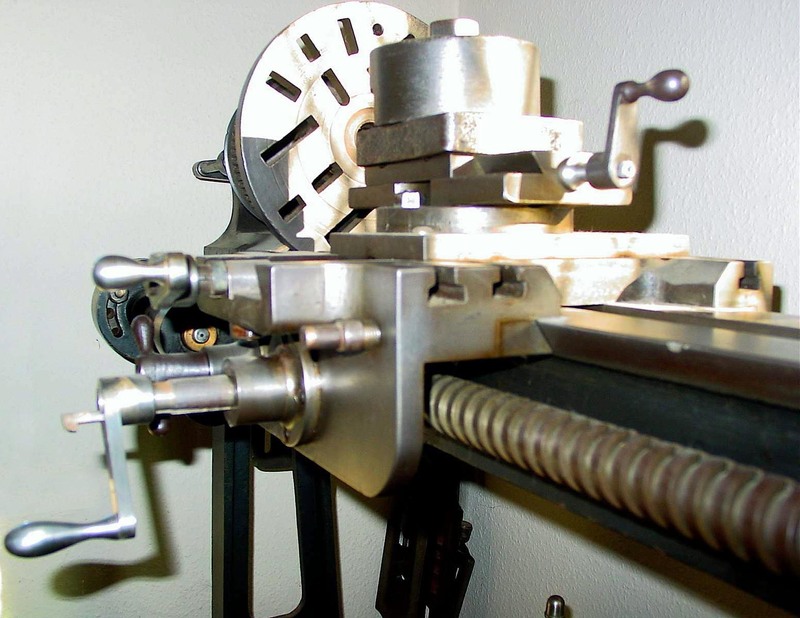 The backgeared headstock held hardened steel bearings with the spindle carrying a 4-step pulley intended for drive by a round leather "gut" rope. 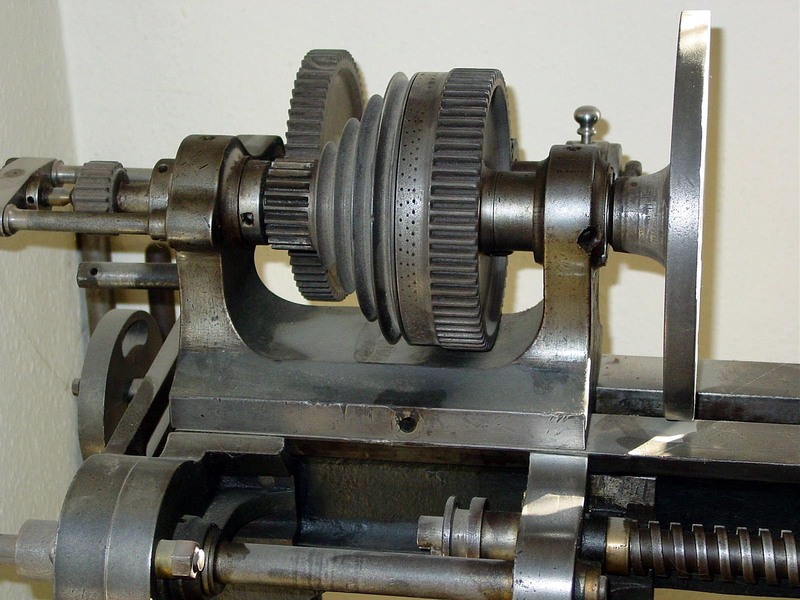 Between pulley and bullwheel (the larger of the two headstock gears) was a plain section drilled with three circles of division holes, a socket being provided in the front face of the casting to hold the (now missing) indent plunger. Drive would almost certainly have been by a foot-treadle (the pivots for which are still intact low down at the back of the standards) although the complete flywheel assembly and associated parts have not, unfortunately, survived. 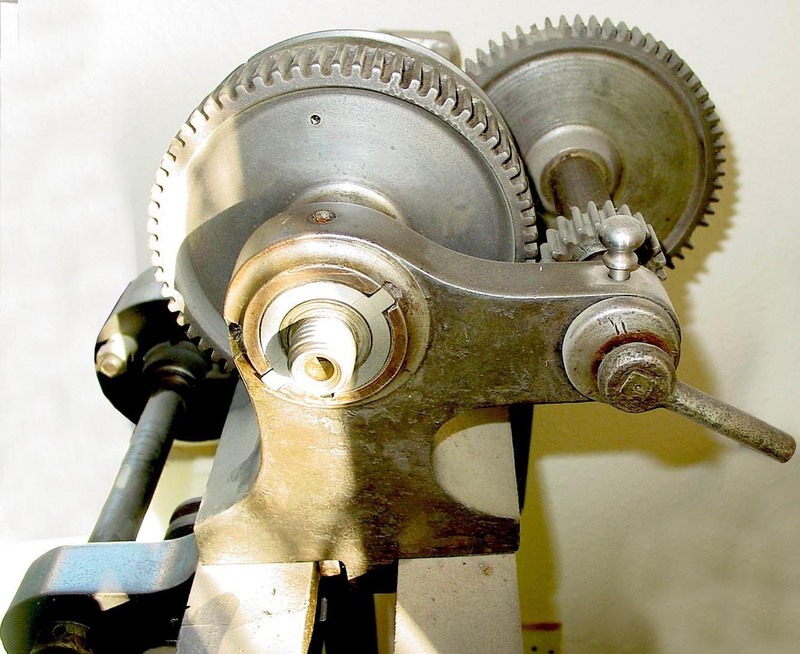 As was common at the time on smaller lathes, the headstock-mounted backgears were simply cast and not machined, though perhaps some hand fettling might have been necessary to get a reasonable fit. Screwcutting was by the usual comprehensive set of changewheels (again, with cast teeth), with some of such great diameter that the bracket carrying them had to be stepped out well away from the front face of the bed in order to fit them in - hence, to accommodate this arrangement, the first stage of the leadscrew drive was by a short plain shaft connected, by a pair of gears, to the leadscrew proper mounted in the normal position, closer to the bed. The explanation for this unusual (if not unique arrangement) was the use of a 2 t.p.i. 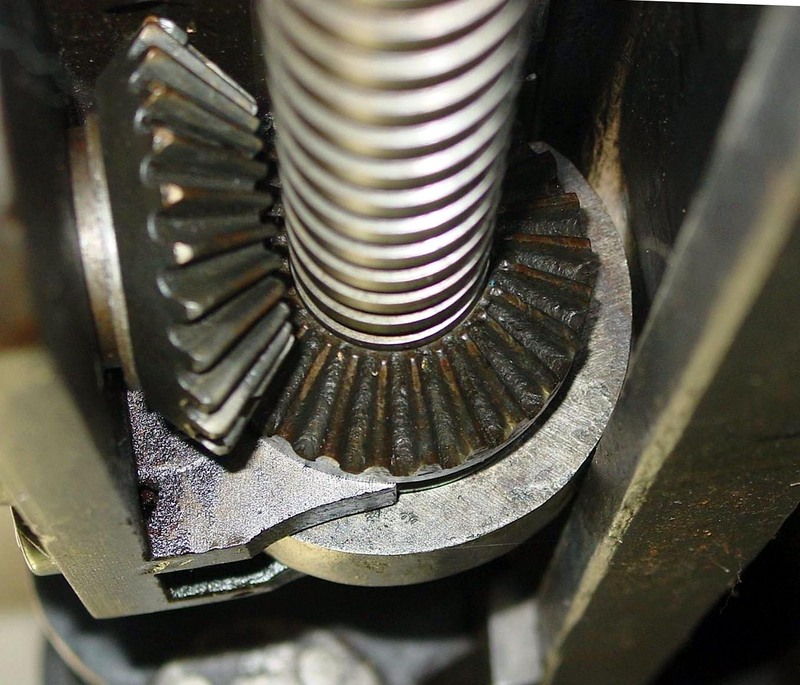 Leadscrew - the very coarseness of which would, without a huge reduction in ratio between headstock and shaft, have produced too rapid a rate of carriage feed with a compound changewheel train of normal-sized gears. As an additional benefit of the design (though surely not the reason for its use) was to allow the drive belt to pass close to the front face of the headstock. Another more interesting possibility is that some form of carriage reverse was originally fitted, with the leadscrew designed to be moved left and right through about an inch - this theory being strengthened by the leadscrew having non-original looking spacers at each end and the fitting (at the headstock end) of a groove to take some form of shifter. The third hole low down in the gear-transfer case could have taken another gear and shaft to give a mechanism to provide forward, reverse and neutral - though how this might have been arranged is not, as yet, clear. The carriage feed by hand was arranged not by the usual bed-mounted rack, but through a pair of bevel gears, the inner of which surrounded the leadscrew and drove it through a key seated in a full-length slot. Cast as one piece with the apron, the saddle was fitted with pairs of T-slots on the front arms and single at the rear. these being aligned with the length of the bed. 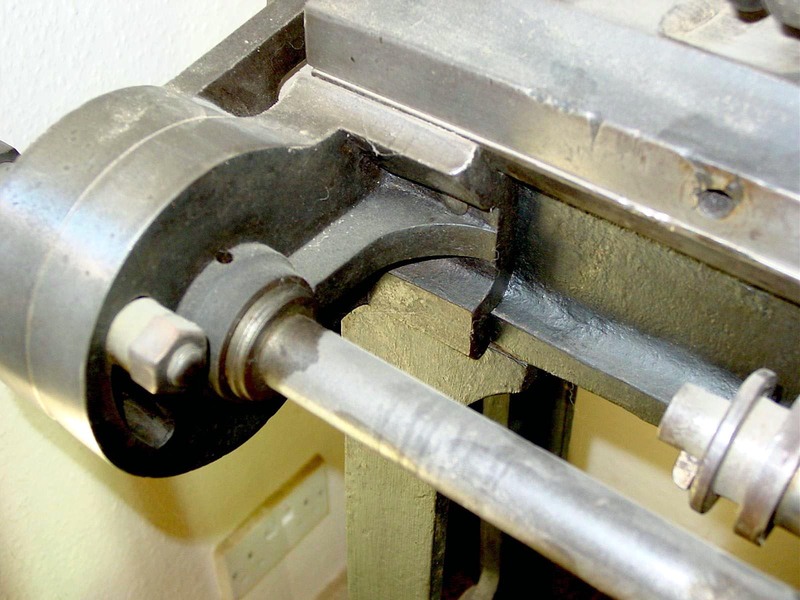 As might be expected from the lathe's age, crank handles were fitted to the carriage traverse and both cross and top-slide feeds with, of course, no micrometer dials - a handy caliper being all that was needed by the skilled artisan of the day to achieve a similar if less easily achieved effect. 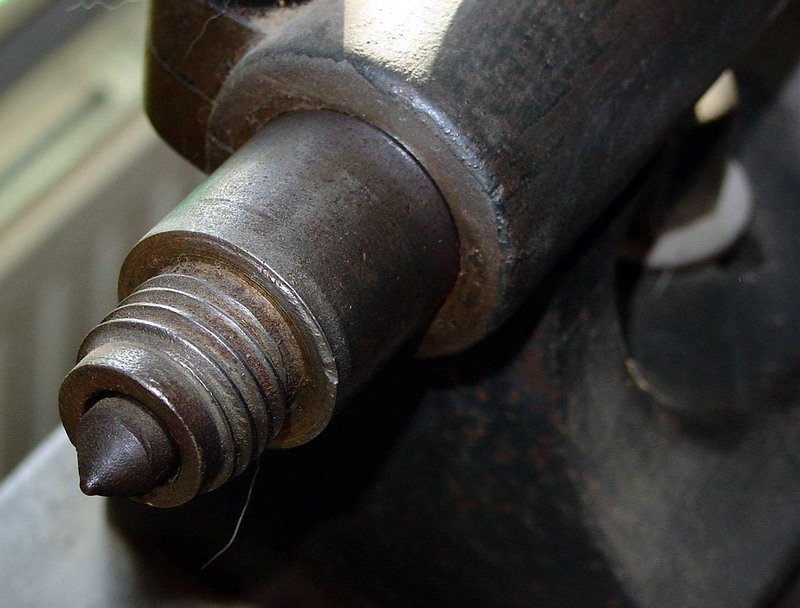 Fitted with both a tapered socked and a thread on the end of its spindle, the upper section of the tailstock could be set over for the turning of slight tapers. Set-over was controlled by a screw, with a single through-bolt used to clamp the upper and lover sections together and lock the whole assembly to the bed..
Screwcutting was by the usual comprehensive set of changewheels, with some so large in diameter that the bracket carrying them had to be stepped out well away from the front face of the bed - hence, the first stage of the leadscrew drive was by a plain shaft connected, by a pair of gears, to the leadscrew proper mounted in the normal position closer to the bed. 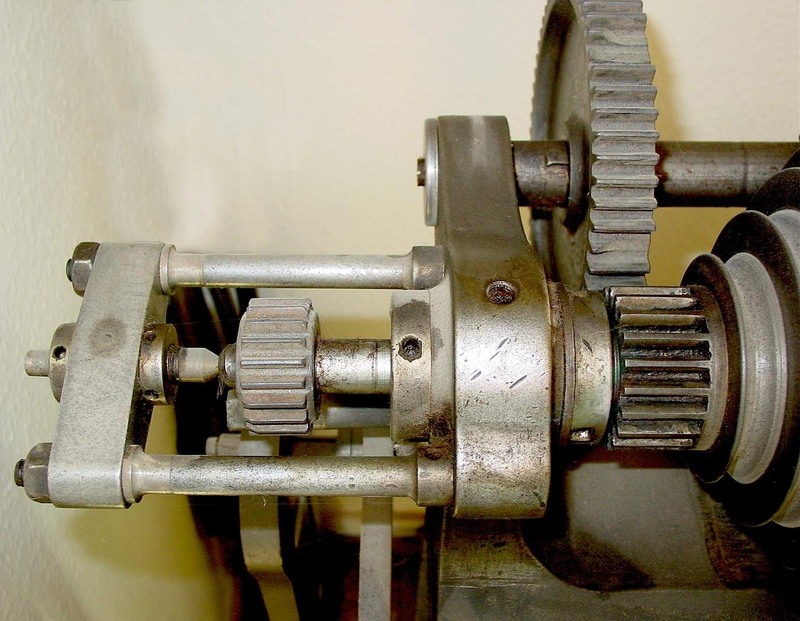 Gears used to bring the leadscrew drive back closer to the bed. 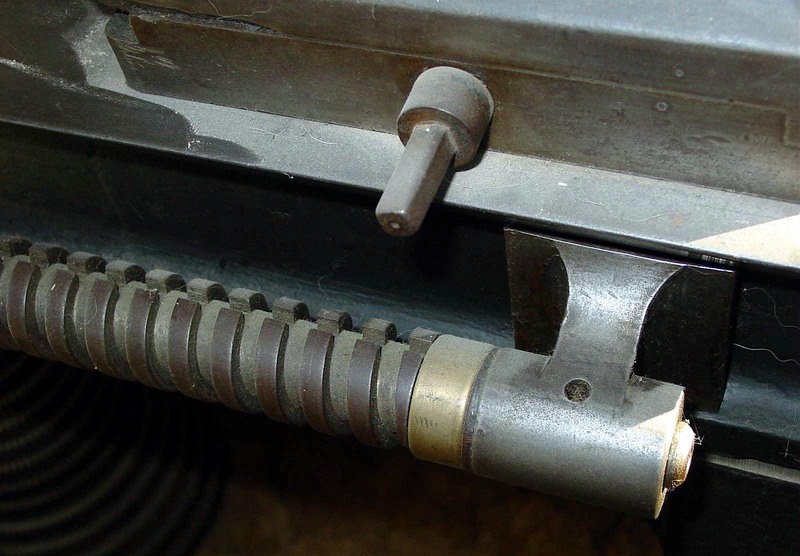 An interesting possibility is that some form of carriage reverse was originally fitted, with the leadscrew designed to be moved left and right through about an inch. This theory is strengthened by the leadscrew having non-original looking spacers at each end and the fitting (at the headstock end) of a groove to take some form of shifter. The third hole low down in the gear-transfer case could have taken another gear and shaft to give a mechanism to provide forward, reverse and neutral - though how this might have been arranged is not, as yet, clear. 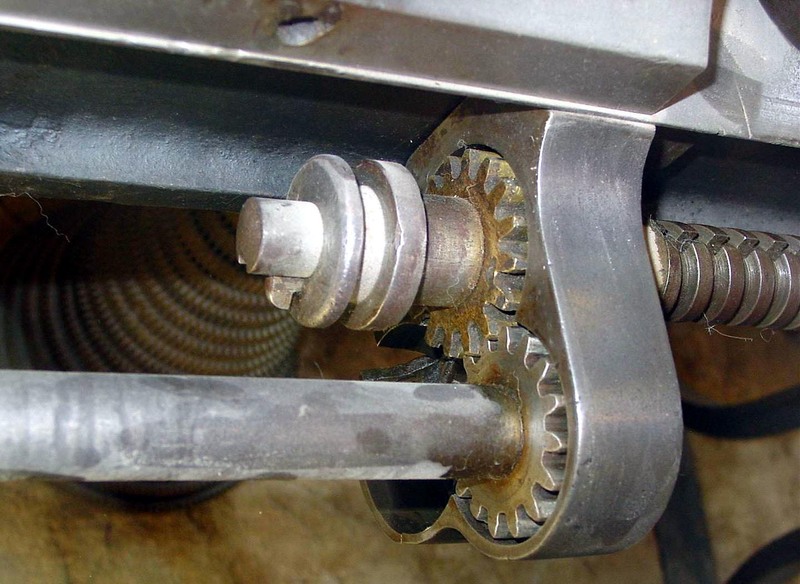 In order to provide a suitable slow hand feed to the carriage, the apron-mounted handle drove the very coarse-pitch leadscrew through a pair of bevel gears.